"Poetry for the discerning biker." "Rubber Side Down combines poetry, essays and photography to challenge the stereotype of the bad boy biker and chronicle the rise of the biker poet and biker poetry. You can add a link to Wild Bill's Culture Corner to your page! Just click here for an easy to use cut and paste HTML code! For more than a decade Wild Bill's Culture Corner has been the #1 location for Biker Poetry on the internet! By Wild Bill © copyright 1996 all rights reserved. 'bout what I'd grow to be. and bikers be my types. with old bikes in decline. to be a Biker Poet. "Poetry for the discerning biker!" Though a serious poet, "Wild Bill" Rogers takes the reader into the humorous side of a lifestyle that is as unique to America as the cowboy and a culture that is largely misunderstood. Bikers Got Culture! contains over fifty poems and limericks of humor, wit, and a touch of the unnatural. The author speaks of a Biker Culture encompassing all walks of life from the lawful to the lawless and from the rich to the poor. "Wild Bill" takes the reader through an entertaining chronicle of the beginnings of what has become one of America's biggest icons using engaging characters, meter and rhyme, then introduces the reader to a sad sack affectionately given the handle of "Oilslick" a fast-talking, beer-drinking, oil-encrusted, bug be-speckled biker. 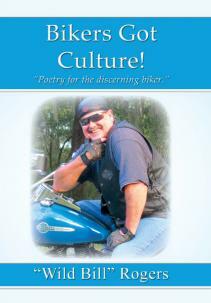 From the mountains of Alaska to the sands of Daytona Beach, this is "Poetry for the discerning biker!" Now available from the publisher at PublishAmerica or Amazon and at Barnes & Noble. �Wild Bill� Rogers has been writing and riding most of his adult life. With his wife Terri he was the Co-Publisher and Editor of Midnight Sun Rider Magazine. His reporting, prose and poetry have been enjoyed throughout the U.S. in print and on the internet. Look what others ar saying about "Bikers Got Culture!" JoGo is interviewed on WGBH Boston about Rubber Side Down. By Bill Griffith of the Boston Globe. A biker who runs her own business, writes poetry, and works for social causes makes it all look simple. By Graham Marlowe; Dr. Rosenblum is arguably the original "Biker Poet" A scholar and historian, he speaks of poetrys relationship with music. Press release for Verse and Steel an anthology containing an excellent selection of work by a number of noted bikerpoets." Christianna McCausland of Baltimore CityPaper reviews Doug and Sorez the Scribe's new release "Living the Life." Todd Ingram of Iron Horse Magazine reviews Doug Barber and Sorez the Scribe's new release "Living the Life." by Panhead Josh on Bikernet. Wild Bill's Culture Corner © 1996, 1997, 1998, 1999, 2000, 2001, 2002, 2003, 2004, 2005, 2006, 2007, 2008, 2009, 2010, 2011, 2012, 2013 all rights reserved.